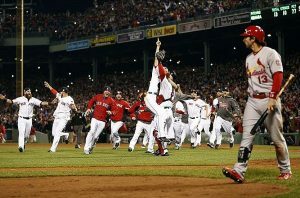 The Boston Red Sox are coming off perhaps the greatest season in franchise history, and one of the greatest seasons any team has ever had. Coming off the ninth World Series championship in franchise history, I wondered how the previous defending champions they have had performed the following season. Still named the Boston Americans, the franchise won the first ever World Series in 1903. They faced the Pittsburgh Pirates in a best of nine series, winning five games to three. The team didn’t change much in the offseason as they got set to defend their world title. The 1904 Americans didn’t hit much, but they had a good rotation fronted by Cy Young. They had three 20 game winners as they won the American League Pennant again. However, the New York Giants of the National League refused to play them in the World Series. As such, the World Series never took place and no team was credited with a victory. Deprived of their chance at winning the first two World Series, the Red Sox didn’t make it back until 1912. That season they steamrolled the competition, winning 105 games and finishing 14 games ahead of the second-place finishers. Smoky Joe Wood won 34 games, including 16 straight. Tris Speaker batted .383 and won the MVP. The Red Sox returned most everyone the following season. However, Smoky Joe faced some injuries as he only made 18 starts. This left a huge hole in Boston’s rotation. The Red Sox “Million Dollar Outfield” performed well, with Tris Speaker, Duffy Lewis and Harry Hooper all living up to expectations. That was not enough, however, as the team finished a distance fourth in the American League. 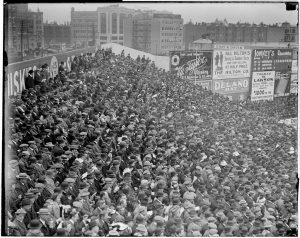 Crowd in third base grandstand with view of left field wall for Game 2 of the 1912 World Series at Fenway Park. Starting in 1915, the Red Sox won three of the next four World Series Championships. In 1915 they won 101 games to edge out the Detroit Tigers for the pennant. They then dispatched of the National League champion Phillies in five games. In 1916 they dropped 10 wins in the standings, yet still managed to win the pennant. 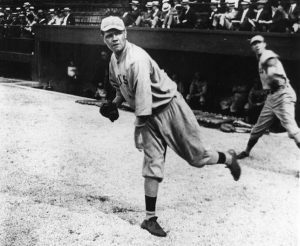 Babe Ruth, who wasn’t allowed to pitch in the previous World Series, pitched excellent in the Fall Classic for the Red Sox as they beat the Brooklyn Robins in five games. The Red Sox were just as good record-wise in 1917, yet finished in second, nine games back of the White Sox. The performance was a good one, but it didn’t have the happy ending of the surrounding seasons. The Red Sox rebounded in 1918, winning the pennant in a season shortened by the first World War. The World Series was played in early September that year. Babe Ruth had started making the transition to batting and led the league in home runs. He still pitched though and was the winning pitcher in two World Series games as they beat the Cubs in six games. The follow-up to the World Series this time around didn’t go so well. Babe Ruth pitched far less, but eviscerated the single season home run record by blasting 29 homers. However, the rotation took a hit. The team had traded three very important players (Dutch Leonard, Duffy Lewis, Ernie Shore) to the Yankees in the offseason. The team fell to under .500 in 1919, coming in sixth out of eight teams. The 86-year drought finally ended in 2004. The sweetest part of all was becoming the first team to ever come from 0-3 down in a playoff series to win, and it was against the Yankees! There were so many heroes on that team, where the championship never would have happened without them. So, what happened in 2005 when they went to defend a World Series title for the first time in most everyone’s lifetime? It could have gone worse. 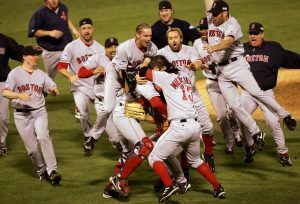 The 2005 Red Sox won 95 games, taking the Wild Card spot. Their play all around the infield dropped off significantly from 2004. All five of their regular starting pitchers posted ERA’s over 4.00, and postseason hero Keith Foulke gave his arm to the 2004 title and wasn’t the same. It’s really quite impressive given all that this team managed to win 95 games. However, they were swept by the White Sox in the first round of the playoffs. The 2007 Red Sox were in first place for every day from April 18th on. David Ortiz was doing David Ortiz things, Mike Lowell and Josh Beckett were paying huge dividends in their second season in Boston, and newcomer Dustin Pedroia won Rookie of the Year. 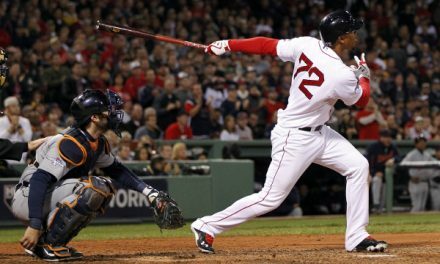 The Red Sox won 95 games in 2008, actually only one less than in 2007. This time though, they would settle for the Wild Card. 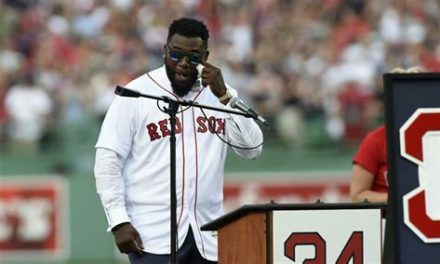 Dustin Pedroia took another step forward, but David Ortiz’ hitting dropped off steeply and Manny Ramirez caused problems for the team until they dealt him at the deadline. Getting Jason Bay back in that deal helped spur the team to a strong finish. The Red Sox dispatched of the Angels, as usual, in the ALDS. Facing the up and coming young Rays team in the ALCS, the Sox put up a valiant effort. Down three games to one and trailing the Rays 7-0 entering the bottom of the seventh in game five, the Red Sox rallied to an 8-7 victory. They then forced a game seven before being stymied by Tampa Bay pitching in a 3-1 game seven loss. Following an embarrassing last place finish under Bobby Valentine in 2012, the Red Sox didn’t go out and make any huge panic moves. 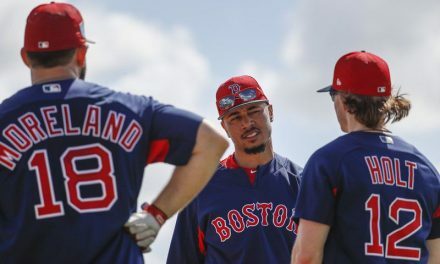 They brought in role players such as Mike Napoli, Shane Victorino and Jonny Gomes, while counting on some other guys to rebound from down seasons. It worked. Galvanized by the Boston Marathon bombings, the team rallied with the city and won the division. They went on to take the Pennant and the World Series too. The follow-up was another embarrassment. The Red Sox went from last, to first, then back to last again. Each of the acquisitions that played such a big role in 2013 suffered huge drop-offs in 2014. Some others just didn’t live up to expectations. 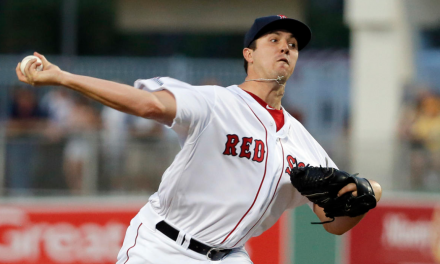 Their only two good starting pitchers, Jon Lester and John Lackey, were traded away by the end of July. So where will this team fall into place in defending their world championship? 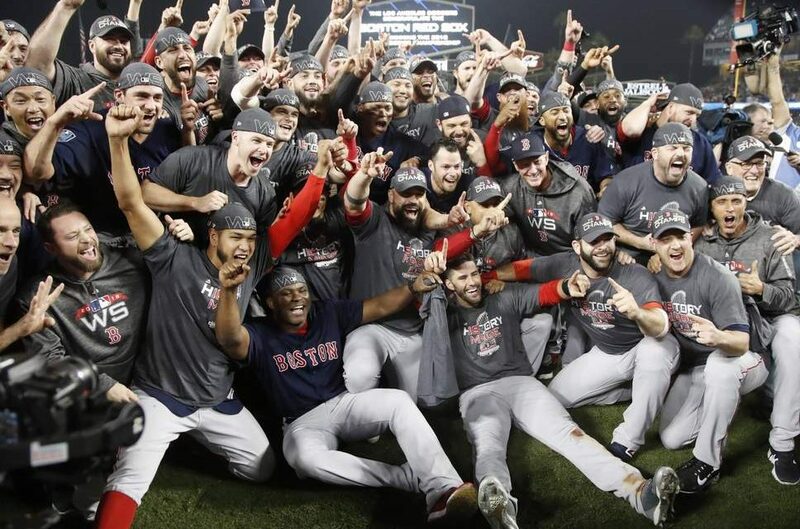 Can they become the second Red Sox team to repeat as world champions? I think it’s fairly safe to say they won’t follow the same route as the last defending champions from 2014. NextWhat are the different game modes in Overwatch? A beginner’s guide.